Yep, there’s been one mighty gap in his recording activities. Taylor of course hit the religious world with his early material, especially Fire and Rain, and more so with the much recorded “You’ve Got a Friend”. Many incorrectly assume he wrote the latter song, whereas its writer was Carole King. There could be an interesting list of mistaken writer songs, not least hearing on the BBC, Pete Seeger being described as the writer of ‘Where Have All The Flowers Gone, rather than Malvina Reynolds, and also whilst mentioning the legendary Pete, he did not write We Shall Overcome, that was penned by the recent departing Guy Carawan (died May 2 2015, aged 87). 3 JESUS MUSIC and beyond..
the great Gospel singer history that has been so influential in US history, and indeed one of the underpinnings of much contemporary music both sides of the Atlantic, is relatively unknown here in the UK. At the same time she influenced many in her own country as she pushed spiritual musi into the mainstream. This amazing woman broke conventions for Jesus. She should not have sung gospel in churches and also perform in night clubs. But she did. She should have sung just gospel, but she sang with big bands behind her. She offended conservative churchgoers with her adventures into the pop world. She would never escape the accusation that she sang “the devil’s music,” They failed to see that she never left gospel music, she took it with her. That said she found life hard when churches began to move into a more secular style of music, and large and somewhat dynamic church concerts became the norm. Her 1945 hit ‘ Strange Things Happen Every Day’ became the first gospel record to crossover from ‘gospel’ to what was then termed “race records” chart that later became the R&B chart – such was the racial division of the time. In some circles she is termed the ‘Godmother of rock ‘n’ roll.’ Its said that long before Mahalia Jackson gospel music to many meant Rosetta. One of her classics has already been mentioned in arguably three best songs with which she can be associated, the other two being the rhythmic up-tempo ‘Up Above My Head’ and ‘This Train.’ All this leads up to saying that there is the recent issue of Volume 1 and Volume Two of her recordings. That said there are plenty of others lying around, with the pick to include the albums Gospel Train and a self-titled affair. A classic is Gospel of Blues, a re-mastered collection of 18 songs. An album hard to find is the 2003 CD, ‘Shout, Sister , Shout, that is an all-star gospel tribute to an artist whose final years were marked by a series of strokes. Should a date stamp of yesteryear deter then go at once to YouTube – forget date and time, just take in a vocal that is so individualistic, it will grab you! In the land of the beyond’ and in re-issue territory, there’s Bobby Womack’s The Preacher with tracks ‘Understanding’ and ‘Communication’ the top rated cuts. Schooled in the gospel family his mentor was one of the early gospel singers, Sam Cooke. Womack played on Presley’s Suspicious Minds. And now on DVDB there comes a variety of artists with recordings of McCartney songs under the title of A MusiCares Tribute to Paul McCartney. The pick track in terms of this column rests with Alicia Keys who gives the gospel treatment to the song blackbird - ‘unexpected’ you might say! (An edited version of this first appeared in The Methodist Recorder). Copy is a press release. 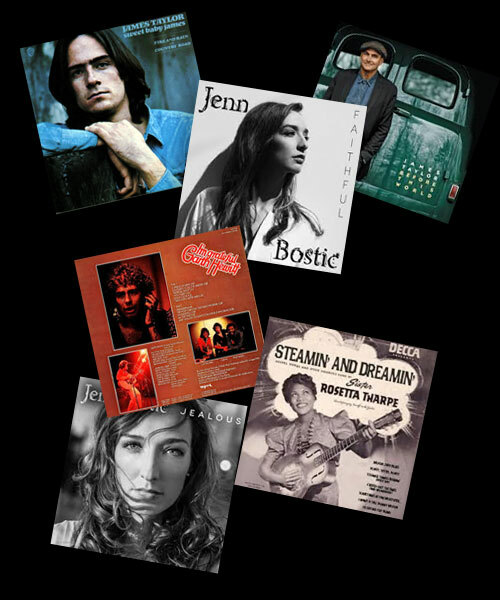 Nashville-based singer songwriter Jenn Bostic returns with her new album, “Faithful”. Having gained heaps of confidence from both the success of her last album, “Jealous”, as well as three tours in the UK and Ireland, Jenn has learnt to trust more fully in her instincts as an artist. ‘Shiny New Toy’ will have you grabbing for the nearest hairbrush and belting along in front of the mirror. “This track is about understanding your value and desiring to be loved and appreciated in a deep way,” says Jenn. She recalls: “I found out about it on Twitter, when someone wrote to say they’d heard the song on Smooth Radio and was moved by it. I thought, ‘An online radio station found it on YouTube – that’s awesome.’ Then I found out that Smooth Radio is one of the biggest stations in the U.K.” ‘Angels,’ which was followed up the U.K. charts by the ‘Jealous’ track “Not Yet,” went on to win five Independent Country Music Association Awards and Jenn was invited to perform it at the Grand Ole Opry. Jenn went on to be the first international independent artist to have three singles—‘Jealous of the Angels,’ ‘Not Yet’ and ‘Missin’ a Man’ —playlisted at Radio 2, the most listened-to radio station in Europe. Famed BBC Radio 2 host Terry Wogan invited her to the station for a special St. Patrick’s Day appearance on his hugely popular Sunday show, Weekend Wogan. Having achieved huge UK success, Jenn aims to further this with her new single and eagerly anticipated album. “With ‘Faithful’, I wanted to get across how important it is that who you are when no one is looking is who you really are. At the end of the day, you have to live with you. If you’re going to create art it’s got to come from heart. It’s not about pleasing other people. 3 Jean Knight – Mr Big Stuff. 4 Richard Thompson – Still.